Prior to becoming America’s World War I “Ace of Aces”, an aviation industry pioneer, owner of the Indianapolis Speedway and before changing his last name to Rickenbaker, Eddie was one of the leading drivers in the country. He participated in one American Elimination Trial for the Vanderbilt Cup Race (1906), two Vanderbilt Cup Races (1915,1916), five Indianapolis 500 Races (1911, 1912, 1914, 1915, 1916) and three American Grand Prize Races (1914, 1915, 1916). Among his major wins were 300-mile races in Sioux City, Omaha and Tacoma. Overall, of the 42 major races in which he started, Eddie won 7 races, finished second 2 times and third 5 times. In his final year as a driver in 1916, he was the #3 ranked driver in the AAA Championship rankings improving every year since 1913; 1915 ranking (#5), the unofficial 1914 ranking (#6) and the 1913 ranking (#31). In a compilation of AAA driver rankings from 1911 to 1916, Eddie Rickenbacker was ranked 4th overall in AAA Championship points. Eddie was the ultimate risk taker stoked with self-confidence. This character trait was evident when he approached Lee Frayer, a pioneer automobile builder, for a job at age 15. The Frayer-Miller automobile construction business was based in Eddie’s hometown of Columbus, Ohio. Frayer didn’t take the boy seriously at first and rejected his offer. But when the bold young Rickenbacher brashly reported to work the next day cleaning the Frayer-Miller shop spotless, Lee Frayer relented and offered him employment. Frayer was impressed to learn Eddie had enrolled in a correspondence course on automotive engineering. He groomed the boy with various assignments in the business. “Here, Eddie. I want you to ride with me. I know that you’re young, and this is new for you, but you have a good head on your shoulders, and I think you’re going to make a good one. Now let me tell you what I want you to do.” My major concern would be the dials showing oil pressure and gasoline pressure. As the gasoline tank was mounted on the tail end of the car, it was necessary to keep pressure in the tank in order to force the gasoline forward into the carburetor. When the pressure of either gasoline or oil fell below the minimum, I would have to pump it back. “Our turn came. The flag went down, and Frayer let out the clutch and jammed the accelerator down. I sat beside him as tight as a spoke in a wire wheel. My eyes flicked over the instruments; oil okay, gas okay. I looked ahead as we came out on the course. We were going to win the race! “Frayer got everything out of the car that it could give. Perhaps he asked for a little too much on a curve, for the right tire blew out. Our rear end swung to the right, then fishtailed down the road at 60 miles per hour as Frayer fought the wheel to keep from piling into the trees. When he had the car under control, he pulled to the side. In a road race, once change a tire whenever it blew. We had rehearsed the procedure over and over and were soon rolling again. We hadn’t continued much further before I saw the temperature gauge was in the red. I could sense Frayer’s eyes flicking over it. I made certain that the oil pressure was up, but there was nothing further either of us could do. The pressure of the wind against my face decreased. At first I heard only a faint knocking. It became louder and louder. Something was pounding in the engine. We were losing speed quickly. Behind us a car was coming up fast. I tapped Frayer on the knee. He nodded and gave way. And the bit Loco thundered by, the engine at a steady roar. Mr. Frayer continued on. He knew that his race was over, but it hurt too much to quit. The pounding grew worse. Any second now the piston would freeze tight to the cylinder wall. He sighed, let up the accelerator, pushed in the clutch, turned off the ignition and coasted to a stop by the side of the road. We sat there for a long moment, and then he sighed and looked at me.” We’re through, he said. That was all. A year of seven-day weeks, an outlay of $50,000 or more, and he hadn’t even finished the elimination run. Yet his only remark was that quiet, “We’re through.” I never forgot it. Gradually, over the years, the significance of that remark sank in, and I drew inspiration from it. To spell it out: Try like hell to win, but don’t cry if you lose. The only known image of Frayer and Rickenbacher at the start line for the 1906 American Elimination Trial was discovered in 2005 in a box at the National Automotive Collection at the Detroit Public Library. In the photo, William K. Vanderbilt, Jr. can also be seen acting in his role of race referee to the right of the car. For Eddie, who lost his father four years earlier, the relationship with Frayer was especially important as a surrogate father. When Frayer decided to leave his company in 1907 to join the Columbus Buggy Company as chief designer and engineer of their new automobile business, Rickenbacker went with him. At the age of 17, Eddie was in charge of the testing department supervising 12 -15 men. Eddie also became a Columbus Buggy Company’s sales manager selling the new Firestone-Columbus car throughout the mid-west. When Eddie was in Texas in 1909 helping to establish dealerships, he drove orator, statesman, and politician William Jennings Bryan on a speaking tour an advertising stunt for the car. In June 1910, as another promotion for the Firestone-Columbus, Eddie entered his first race as a driver on a dirt track in Red Oak, Iowa. He was unable to finish the 25-mile race when the Firestone-Columbus crashed into a fence while rounding a turn. The accident left Eddie bruised and battered and hooked on becoming a race car driver. Rickenbacher started racing at all dirt tracks within a 100-mile radius of Omaha including a 100-mile race in Columbus in which he lost to Lee Frayer and Barney Oldfield. Impressed by Eddie’s driving, Lee Frayer asked him to be his relief driver the first Indianapolis 500 Sweepstakes race held on May 30, 1911. Eddie drove over 300 miles of the race from approximately the 30th mile to the 400th mile. Frayer and Rickenbacher finished 13th, of the 40 entrants completing 197 of the 200 laps. The “Red Wing” Firestone-Columbus was still running at the end of the race when it was flagged after the first 10 cars had crossed the finish line. Just prior to this 1912 race, Lee Frayer retired from racing and turned the Red Wing racer to Eddie. He was running fourth when a crankshaft bearing burned out ending his race. Rickenbacher finished 21st of the 23 entrants completing 44 of the 200 laps. With the Columbus Buggy Company near bankruptcy, Eddie quit his job and set out on a career as a professional race car driver. I wanted to drive good cars fast, to pit my automobile knowledge and driving skill and plain old guts against the world’s best.” Without financial support to enter prominent races, Eddie raced in various country fairs mainly in Iowa. But, following a spectator accident in Mason City, Iowa, the AAA Contest Board suspended Eddie’s racing license until January 1914 for participating in “unsanctioned meets”. Unable to drive in AAA races, Rickenbacher moved in the summer of 1912 to Des Moines, Iowa. He found a job working as a mechanic for Fred and Augie Duesenberg who were designing and building four-cylinder race cars for the Mason Automobile Company. Following a successful request from N.J. Ruggles, president of the Columbus Automobile Club, the AAA reinstated Rickenbacher six months earlier so that he could drive as a “native son” at the Fourth of July race. After leading after the first lap, Eddie’s #6 Mason was forced out with a broken drive shaft after 107 miles of the 200-mile race. Rickenbacher finished 7th of the 8 entrants. One of the most challenging and durable of the earliest road racing series was held in Elgin, 50 miles west of Chicago. The races were held over several days from 1910 to 1920 and again in 1932 and 1933. The course consisted of 8.5 miles of country roads. In the first race of the 1913 Elgin Races, Rickenbacher finished 5th of the 8 entrants completing 27 of the 36 laps before being flagged at the end of the race. Racing in his first Elgin National Trophy Race, Eddie left the race quickly during the first lap. When the car in front of him skidded, to avoid a collision Eddie drove into a ditch breaking his rear axle. Rickenbacher finished last of the 12 entrants. Despite racing only in the second half of 1913, Eddie finished tied for 31st in the 1913 AAA National Championship rankings. The 1913 champion was Earl Cooper. “A young Prussian nobleman who had fallen victim to the deadly Bacillus Motorus. Crazed by a lust for speed , he had absconded from the Vienna Military Institute in a stolen Mercedes. Expelled from the institute and disinherited by his father, he went to America to enter the AAA tour”. “Baron Edward von Richenbacher” was actually Columbus native Eddie Rickenbacker, the son of Swiss immigrants, Ohio. Despite these facts and Eddie’s previous racing accomplishments, Baron Richenbacher was listed as the driver of the Mason in the official Santa Monica Program Guide. However, heavy rains pushed back the races five days and allowed Dave Lewis to recover from his injuries and bump Eddie from the Vanderbilt Cup Race in the Mason. Using his connections with the organizers, Mack Sennett made a film “Mabel at the Wheel” with the real Vanderbilt Cup Race and spectators in the background. The film starred Mabel Normand, Charlie Chaplin, Ben Turpin and Sennett and is the only known documentation of the race. With Dave Lewis driving the rebuilt Fiat that was damaged during practice, the “Baron” drove in the American Grand Prize Race. After completing 38 of the 48 laps in the #20 Mason, Eddie left the race due to a broken crankshaft. He finished a respectable 8th in the field of 17 cars. With World War approaching with Germany, it was one of the last races in which Eddie was promoted as Baron Richenbacher. In 1913, when owner of the Mason cars decided to curtail their racing activities, the Duesenberg brothers broke away from their sponsors and set up the Duesenberg Motor Company. Their initial interest was to build racing cars based on the Mason design and their engine experience. These early racing cars would pave the way for one of the world’s great marques; the Duesenberg brand of classic cars. One of the brother’s first actions was to appoint Eddie Richenbacher manager of their racing team and prepare him to drive the one of the two new Duesenbergs to compete in the Indianapolis 500 Race. Driving the red, white and blue #42 Duesenberg, Eddie finished a strong 10th of the 42 entrants, averaging 70.8 mph and winning $1,400. The second Duesenberg of Eddie’s team driven by Willie Haupt finished 12th in the race. Eddie’s first win of a major race occurred in the 300-mile race in Sioux City. Among the 15 other drivers that Eddie beat were Spencer Wishart (by only 40 seconds), Vanderbilt Cup winners Harry Grant and Ralph Mulford, and Barney Oldfield. Eddie covered the 150 laps of the 2-mile course at an average speed of 78.6 mph to capture the large $10,000 purse for first place. The win helped saved the new Duesenberg company from bankruptcy. Towards the end of the 1914 season, Eddie switched teams again to Peugeot. Eddie remarked “I wanted to drive the French Peugeot. The French were building superior cars, and the Peugeot was the best of them all. It has speed, endurance and maneuverability”. A deal was made in time for the 302-mile Corona Road Race in California. Asked to compare road racing to the oval tracks, Eddie responded “I always preferred the challenge and variety of road racing to going around and around like a ball on a string”. Before the Corona Race, Eddie completely overhauled his Peugeot and painted it white. In an effort to improve communication between the driver and mechanician, Eddie designed special masks connected by tubes. “We looked like men from outer space. The acoustics were fine, but in the race the face masks became unbearably hot and itchy”. After initially leading the race, Eddie’s drive shaft failed after 37 laps. Rickenbacher finished a disappointing 15th of the 19 entrants. Although the AAA did not award driver points during the 1914 season. They were assigned retroactively in 1927 and revised in 1951. Rickenbacher was unofficially ranked sixth in the rankings. The unofficial champion was Ralph DePalma. After only one more unsuccessful race in the Peugeot, Eddie quit the team in what he later considered the biggest mistake in his racing career as the same Peugeot would capture several major races in both 1915 and 1916. Rickenbacher joined the 3-driver Maxwell team that included Barney Oldfield and Bill Carlson. The first challenge would be the American Grand Prize Race followed soon after by the Vanderbilt Cup Race. Both races were held in conjunction with the Pan-Pacific International Exposition on a 3.9 mile course on fair grounds in San Francisco, California. The American Grand Prize Race was run in a torrential downpour that significantly affected the performance of the cars. Eddie completed 41 of the 104 laps (406 miles) stopped by soaked ignition wires and finished 25th of the 30th entrants. The winner of the race was Dario Resta who won in Eddie’s former Peugeot car. Due to the California storms and commitments of the foreign racing teams, the Vanderbilt Cup Race was postponed from February 22nd to March 6th. It was the only time the Grand Prize was run as the preliminary race before the Vanderbilt Cup Race in the two-race series run in 1911-1912 and 1914-1916. In his first Vanderbilt Cup Race as a driver, Eddie was even less successful that his Grand Prize performance. After leading the first five laps, he completed only 7 of the 77 laps (301 miles) due to engine failure. The winner of the race was again Dario Resta in Rickenbacher’s former car and became the first driver to win the Grand Prize and Vanderbilt Cup Races in the same year. In his fourth Indianapolis 500 Race, Eddie struggled completing only 103 of the 200 laps before leaving the race after breaking a rod and finishing 19th in a field of 24 cars. Eddie finished in third place behind Resta’s Peugeot in this 500-mile race at the board oval at Speedway Park in Chicago. Eddie averaged 93.9 mph and won $3,000. The winning Peugeot averaged a record 97.6 mph for a 500- mile race. For the second consecutive year, Eddie captured the 300-mile Sioux City Race. Leading almost the entire distance, Eddie’s Maxwell averaged 74.5 mph. Despite the sad news that his teammate Billy Carlson has been killed in Tacoma the day before, Eddie “Richenbacher” won again in the 150-mile race in Omaha averaging 91.2 mph. It was the first race at the1.25 mile board oval Omaha Auto Speedway. In July 1915, faced with continuing losses, the owners of the Maxwell team announced they had decided to quit racing. Seizing an opportunity to field his own racing team, Rickenbacher used his own money and financial support from Carl Fisher and Fred Allison of the Prest-O-Lite Company and purchased four Maxwells and field his own race team. Eddie managed the Prest-O-Lite Team and rebuilt the cars into more competitive racers called Maxwell Specials. This agreement marked the first time, Eddie used the name “Eddie Rickenbacker” substituting a “k” for the more Germanic “h”. In addition, Eddie added a “V” as a middle initial. Eddie chose Vernon to match the initial. Eddie was then promoted as either Eddie Richenbacher, E.V. Rickenbacher, or Eddie Rickenbacker before the last name became widely used in the World War environment. As an example, the official program for the initial race at the new Narragansett Park Speedway in Providence listed “Eddie Rickenbacker” as the driver and entrant and described “Eddie Rickenbacher” in the following profile. “Eddie Rickenbacher, the “Car Breaker”, is known as the “Samson” of auto race drivers, as it takes a car of the most powerful construction to withstand the strain he puts upon a machine in getting all there is in speed possibilities. The Big Fellow has proved his class in many a hard-fought race. His most recent achievement was taking third place at Chicago. Last year he won at Sioux City. In 1913, he competed on the dirt tracks and ran up a string of 34 first, 17 second and 14 third places. He was in money 65 times out of 73 starts. It was the training in “taking chances” on this circuit that developed in Rickenbacher the fearlessness that makes him a competitor feared wherever motor car pilots meet to match their skill and daring”. Eddie won the first race in which he competed with the Maxwell Special at the opening of this one-mile concrete oval course. The big win of the 100-mile race was witnessed by 40,000 spectators. During this period of racing, giant, high banked oval speedways made of wood planks sprouted up around the country including the track at Sheepshead Bay, New York- the site of the Astor Cup Race. The Cup was donated by Vincent Astor, the son of John Jacob Astor IV, and drew some of the best cars and drivers in the country. The smooth surface and the banking made for tremendous sustained speeds in excess of 100 miles per hour and also dangerous. This is where Harry Grant, the jovial, ever smiling burly driver and two-time Vanderbilt Cup Race winner met his end. While practicing for the race, the Maxwell racer that Grant was driving suddenly burst into flames at nearly 100 miles per hour. Grant slowed and steered the car to the bottom of banking. His riding mechanician, Red Stafford, bailed out to safety. Grant with his five-foot, eleven inch stocky frame, had difficulty extricating himself from behind the steering wheel. While flames engulfed the car, Eddie Rickenbacher, Grant’s teammate and fellow driver Earl Cooper raced to his aid. The drivers and track workers simply could not help Grant fast enough. He survived the accident and was taken to Coney Island Hospital in Cooper’s Stutz racer. With dreadfully extensive burns from the waist down, he died there ten days after the accident on October 7, 1915 and two before the Astor Cup Race. In the 300-mile race that marked the opening of the Sheepshead Bay Speedway, Eddie finished 14th of the 20 entrants in the Maxwell Special completing 55 of the 175 laps. With 3 wins among the 12 AAA races that he entered in 1915, Eddie finished the 1915 AAA National Rankings in 5th place. Earl Cooper was the national champion. In his fifth Indianapolis Speedway race, after leading the first 25 miles, Eddie finished 20th of the 21 entrants completing only 9 laps due to engine problems. After leaving his own Maxwell, Rickenbacker took over teammate Pete Henderson’s #4 Maxwell and finished in 6th place. The race was reduced to 300 miles from 500 miles due to the World War. Eddie took third place of the 12 entrants in the 150-mile race over the one-mile board oval course at the Des Moines Speedway. During the qualifying runs for the second annual Omaha Derby, Eddie set a world record for 25 miles, averaging 102.6 mph. While running fourth after 75 laps, Eddie left the Derby with valve problems and finished 11th of the 17 entrants. After a July rain-out, the Montamarathon and Potlach Trophy Races were combined into one race at the Pacific Coast Speedway in Tacoma, Washington. Tommy Milton in a Duesenberg led for the first 200 miles. But, Rickenbacker passed him 26 laps later to win the 300-mile Montamarathon/Potlach Trophy Race averaging 89.3 mph. It would also be Eddie’s last win racing for Maxwell, losing his next five races. In his second Astor Cup Race at the Sheepshead Bay Speedway, Rickenbacker finished a strong second in the 250-mile race. John Aiken won the race in his Peugeot, averaging a world record 104.83 mph. However, frustrated with his inability to win since August, Rickenbacker abruptly disbanded the Maxwell Special Team in October 1916 and began looking for a new racing partner. The offer to driven again came from chemical tycoon William Weightman who had purchased two Duesenbergs and wished to race them in the last three major AAA races to be held in California in November. With an outside chance to win the driver championship, Rickenbacker accepted the offer to once again drive a Duesenberg. The first two races were the Vanderbilt Cup Race/American Grand Prize series which returned to Santa Monica. In his second Vanderbilt Cup Race as a driver, Rickenbacker finished 17th of the 19 entrants in the 295 mile race completing only 6 of the 35 laps when he left lthe race due to stripped gears. William Weightman finished a surprising third in his other Duesenberg. Dario Resta in his Peugeot won the race clinching the 1916 national championship. And the title of “Champion driver of America”. Two days after the Vanderbilt, the American Grand Prize Race was held on the same Santa Monica course. Eddie broke his driveshaft on the 28th lap of the 48 laps and finished 9th of the 21 entrants in the race. Rickenbacker then relieved William Weightman on the 30th lap and finished with the #21 Duesenberg in 5th place before being flagged. In the final race of the year, Eddie finished first at the 150-mile race at the Ascot Speedway in Los Angeles. It would turn out to be Rickenbacker’s last race as a driver. Rickenbacker finished third in the 1916 AAA National Championship behind Dario Resta and Johnny Aiken. Following his racing career, Eddie joined the American Expeditionary Force in 1917 and was attached to the newly formed Aero Pursuit Squadron. The insignia on the squadron was Uncle Sam's stove pipe hat with stars and stripes in a ring, symbolizing the American custom of throwing a “hat into the ring” as a challenge. Although he was two years older than the military age limit of 25 for flying, his military career as a pilot is legendary. Rickenbacker became America’s top fighter pilot during World War I and earned the title as America’s “Ace of Aces”. In a brief seven months of wartime flying in 1918, he downed more enemy aircraft than any other American, shooting down 22 German planes and four observation balloons. "Edward V. Rickenbacker, Colonel, specialist reserve, then first lieutenant, 94th Aero Squadron, Air Service, American Expeditionary Forces. For conspicuous gallantry and intrepidity above and beyond the call of duty in action against the enemy near Billy, France, 25 September 1918. While on a voluntary patrol over the lines Lieutenant. Rickenbacker attacked seven enemy planes (five type Fokker protecting two type Halberstadt photographic planes). Disregarding the odds against him he dived on them and shot down one of the Fokkers out of control. He then attacked one of the Halberstadts and sent it down also." At the age of 32, in September of 1922, Eddie married Adelaide Frost Durant, originally of Grand Rapids, Michigan. Adelaide had previously been married to Cliff Durant, a race car driver and son of William Durant, the founder of General Motors. Eddie and Adelaide adopted two sons, David Edward and William Frost. In 1927, Rickenbacker assumed control of the Indianapolis Motor Speedway for the purchase price of $750,000. His accomplishments included guiding it through the Depression and arranging for the first live radio broadcast of the Memorial Day 500 race. He closed the Speedway in 1941 for the duration of World War II. In 1945, Eddie sold the Speedway to Anton Hulman, Jr., whose family still owns it. Eddie later worked for the Cadillac division of General Motors Corporation and then became associated with a number of aircraft manufacturers and airlines. In 1926, Rickenbacker joined the commercial aviation industry. He founded Florida Airways, which he soon sold to Pan American Airlines, before becoming vice president with General Aviation Corporation (formerly Fokker). In 1933, he joined North American Aviation as a vice president and general manager of the subsidiary Eastern Air Transport- eventually reorganized as Eastern Air Lines. In 1938 he realized his crowning achievement in business when he assembled the necessary $3 million in capital to win a bidding war and purchase Eastern Airlines from then parent General Motor. He became president and director. On February 26, 1941, Rickenbacker's personal luck nearly ran out. He was aboard a DC-3 equipped as a sleeper that smashed into trees on an approach to Atlanta; 11 passengers and the two pilots died. For days Rickenbacker, badly injured, hovered between life and death, and it took nearly a year before he could get back to work. Afterward he slumped a little and walked with a slight limp. During World War II, his experience and technical knowledge prompted his appointment as special representative of Henry L. Stimson, Secretary of War, to inspect air bases in the Pacific. As if to top it all off, larger-than-life, he survived an incredible life and death struggle in the middle of the Pacific Ocean. During a late 1942 tour of bases in the Pacific, the B-17 Rickenbacker was flying in ran out of fuel. The crew ditched the plane in the ocean, but in the confusion forgot the emergency rations. The eight men then spent 22 days on three rafts without food or water. Three weeks later, a Navy patrol plane found the crew. Eddie Rickenbacker was back in the news, his luck having gotten him through another adventure. Yet he refused to go home to recover; he wanted to finish his mission. Later, he returned to Washington to brief Secretary Stinson on recommendations for survival equipment to be added to all Air Corps planes immediately. Among the recommendations were a rubber sheet to protect the crew from the sun and catch water, and seawater distilling kits. Both items are still standard issue on U.S. military lifeboats and airplane life rafts. In 1953, Eddie became Chairman of the Board and retained the general manager position. 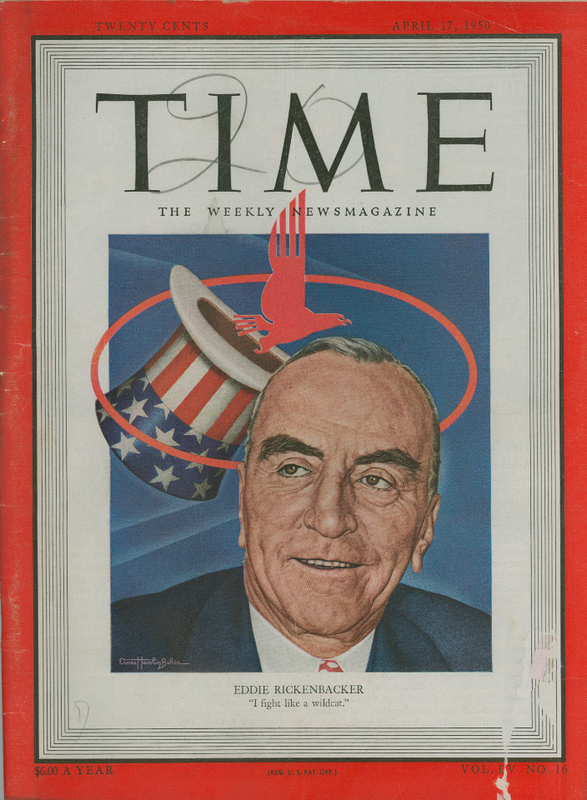 Rickenbacker reluctantly retired from Eastern on the last day of 1963 at age 73. After leaving Eastern, began touring the country as a speaker. Earning anywhere between $300 and $1,000 per speech, Eddie divided his earnings between several charitable organizations including the Boy Scouts of America and the Big Brothers Association. He bought a small ranch near Hunt, Texas, but it proved to be too remote, especially for his wife, Adelaide. After five years, they donated the ranch to the Boy Scouts, lived in New York City for a while, and then moved to Coral Gables, Florida. In 1965, Rickenbacker provided a series of interviews with writer Booton Herndon resulting in his autobiography “Rickenbacker; An Autobiography”. By the end of 1968, Prentice-Hall had sold over 250,000 hard cover copies. Rickenbacker suffered a stroke in October 1972, but his luck struck again, and he recovered to visit Switzerland to seek medical help for his wife. He died there of pneumonia at the age of 82 years on July 23, 1973. Eddie's eulogy was delivered in Miami by General "Jimmy" Doolittle. He buried beside his mother in the Columbus, Ohio, family plot. Four jet fighters flew overhead during the ceremony. One turned on its afterburners and zoomed up and out of sight in the traditional Air Force "missing man" salute to a brother pilot. In an obituary published in a national magazine, his son William Rickenbacker wrote: "Among his robust certainties were his faith in God, his unswerving patriotism, his acceptance of life's hazards and pains, and his trust in persistent hard work. No scorn could match the scorn he had for men who settled for half-measures, uttered half-truths, straddled the issues, or admitted the idea of failure or defeat. If he had a motto, it must have been the phrase I've heard a thousand times: 'I'll fight like a wildcat!'" In 1974, the Lockbourne Air Force Base in Columbus, Ohio was renamed for Eddie Rickenbacker. The Eddie Rickenbacker International Airport is used primarily as a cargo airport for the city of Columbus and for growing number of passenger charter carriers. The United States Air Force maintains a presence in the Ohio Air National Guards 121st Air Refueling Wing, the first Air National Guard unit to fly KC-135 tankers. In 1995, the United States Postal Service issued postage stamp in honor of Rickenbacker's accomplishments as an aviation pioneer. In 2005, the definitive biography of Eddie Rickenbacker “Eddie Rickenbacker: An American Hero in the Twentieth Century” was written by historian W. David Lewis. Over the years, several myths have been become part of many Eddie Rickenbacker profiles. Myth: Eddie Rickenbacker participated in the 1906 Vanderbilt Cup Race Fact: Eddie was the driving mechanician for the #8 Fray-Miller during the 1906 American Elimination Trail for the Vanderbilt Cup Race. Myth: Many of his racing profiles and his New York Times obituary claim Rickenbacker set a world speed record of 134 mph in a Blitzen-Benz at Daytona Beach. Fact: Eddie never raced at Daytona Beach nor set a speed record with the Blitzen-Benz. Myth: Eddie Rickenbacker was the personal driver for General John Pershing at the start of the World War. Fact: Eddie never drove for General Pershing. A point on driver’s championship standings in the early days: they were fabricated after the fact. There is a long story behind this, but AAA PR directors (Val Harsnape in the ‘20’s and Russ Catlin in the ‘50’s) both practiced revisionist history for whatever promotional advantage they thought they could derive from doing so. This is a big controversy among auto racing historians, but the truth is that the first official national championship determined by points (previously, some Motor Age had selected, subjectively their choice of champion) came in 1916 with Dario Resta. With WWI the next championship did not come until 1920. Even then, Catlin tried to change the result at some point during the 1950’s to move Tommy Milton into the champion’s slot. The whole thing is unfortunate because much of this confusion persists today.